Simmons was born in Los Angeles, California, on the 7th of July 1992 to Canadian born actress and model Shannon Tweed and Israeli-American singer/Kiss bass player Gene Simmons, thus, she has dual citizenship from both America and Canada. Sophie is not an only child, she has an older brother named Nick Simmons. She attended Pitzer College Claremont, California, where she majored in religious studies and computer engineering. She also attended Pomona College, while at the college, she was actively involved with the volleyball team. Simmons said she initially avoid going in the path of her parents’ career because she didn’t want any form of comparison between her and her parents but as fate would have it. she ended up in that path and has actually caved a niche for herself. At age eleven, Sophie Simmons began appearing on Gene Simmons Family Jewels which aired on A&E alongside her parents and older brother for the seven seasons it aired on the network (2006-2012). After the show ended, she lent her voice to Sophie’s Place campaign – a child advocacy center which is partly funded by the government. Through the help of the Royal Canadian Mounted Police and the mayor of Surrey, British Columbia, Dianne Watts, she was able to advocate for the creation of the center which Sophie and her family have continued to support by raising funds for the organization which has continued to be a safe atmosphere where children discuss with trained staff and law enforcement professionals on issues bothering on mental, physical and sexual abuses. That same year, Sophie Simmons entered for the season two of Fox music competition show The X Factor but was eliminated at the Bootcamp stage. In June 2013, she performed at the Greek Theatre, Los Angeles, California alongside Canadian vocal group The Tenors. In 2014, she went into modeling and launched a body positive clothing line for The Style Club. She also began advocating for body positivity; in 2016, Simmons was featured in the documentary Straight/Curve which discusses body in modeling. 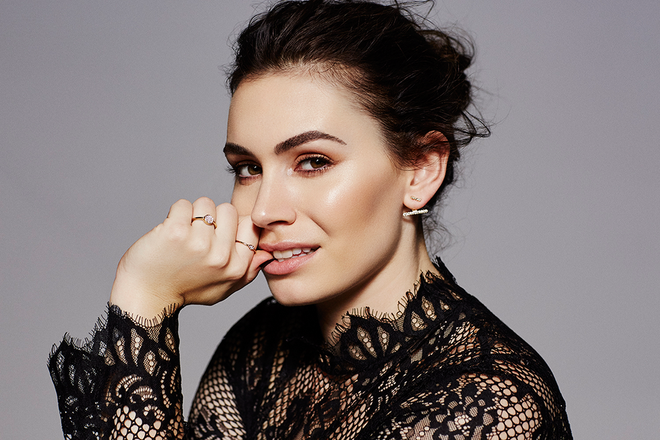 Sophie Simmons, he drooped a debut single Kiss Me in 2015; in 2017, she collaborated with the DJ duo Yellow Claw for a song in Los Amsterdam which is their second studio album. In early 2018, Sophie Simmons dropped two solo singles, Burn Me Down and Black Mirror. Black Mirror debuted at number 43 on the Billboard’s Dance Club Songs Chart and remained on the list for ten weeks until it peaked at number twenty. Later, she did a single with DOLF and Yellow Claw titled Cry Wolf which was released in April of the same year. The song which had Simmons on vocal dropped before Yellow Claw’s third album New Blood was released. Sophie was credited as one of the composers of one of the songs on the album which featured San Holo. In June, she dropped “Paper Cut”, her third solo single of the year. Sophie’s net worth is currently estimated at a whopping $10 million; this figure is her earning for working so hard as a singer, model, and as a TV personality. She still does what she knows how to do best and as it is consistent with every smart, creative and hardworking artist, her net worth won’t remain static but would rather increase in the nearest future. Boyfriend – Who is She Dating? Sophie Simmons began dating Christopher James in 2013, they kept their relationship a secret until they were spotted in Hawaii in September of the same year on vacation. The next year, the couple ended their relationship which was not also made public but rumors had it that James broke it due to her weight issues. The following year, Sophie shocked everyone when she appeared with a transformed and sexier body having lost pounds of flesh. Although the pair never got back together after her weight loss, the upcoming singer seems happier and more confident in her “new body”. Between 2014 and 2017, Sophie Simmons was linked with James Kimble but not much was seen and heard of them thereafter. She seems to be single at the moment. Soph, as she is fondly called by friends, stands at a height of 171.5 cm, which is 5 feet 7.5 inches. Following her weight loss in 2015, she currently weighs 161 lbs.